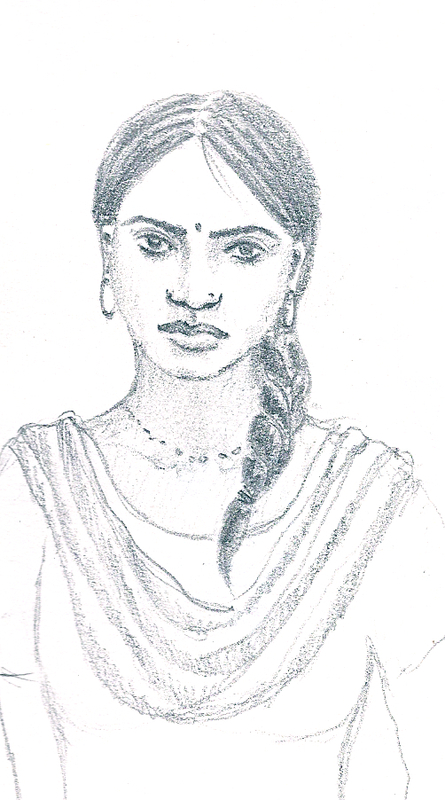 I based this sketch on a young woman I had seen in Varanasi, a mixture of two different women actually. Since I wasn’t able to do a proper portrait with her sitting still, I just went from memory. I had been trying to draw faces that were recognizably Indian for a while, and this woman seems to be the most convincing. In fact, when I showed my sketchbook to some Indian guys they separately said “ooh beautiful, who is she?” as if they wanted to be introduced to her. Sorry guys, she only exists on paper. This is great- so simple, but so much expression!